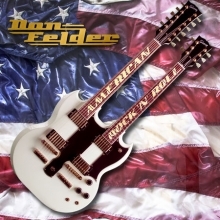 Former Eagles guitarist and songwriter Don Felder has announced the release of his highly anticipated all-new album American Rock 'N' Roll which features guest appearances from Sammy Hagar, Slash, Richie Sambora, Orianthi, Peter Frampton, Joe Satriani, Mick Fleetwood, Chad Smith, Bob Weir, David Paich, Steve Porcaro, and Rush's Alex Lifeson. Lifeson appears on the album's 2nd track - Charmed - playing acoustic rhythm guitar on the song's bridge and electric guitar on the song's ending solo. The album is slated for release on April 5th via BMG and is now available for pre-order. The album's title track is available for streaming at this location and you get all the details here (thanks Eric at Power Windows). Lifeson will also be making guest appearances on upcoming albums from legendary blues guitarist John Mayall and prog rock supergroup The Mute Gods. Lifeson will appear on Mayall's Nobody Told Me album, which releases on February 22nd, where he's featured on a recording of Evil And Here To Stay (a 1992 Jeff Healey song). Lerxst also makes an appearance on The Mute Gods' third studio album Atheists And Believers, due out March 22nd, performing on the album's 2nd track - One Day.